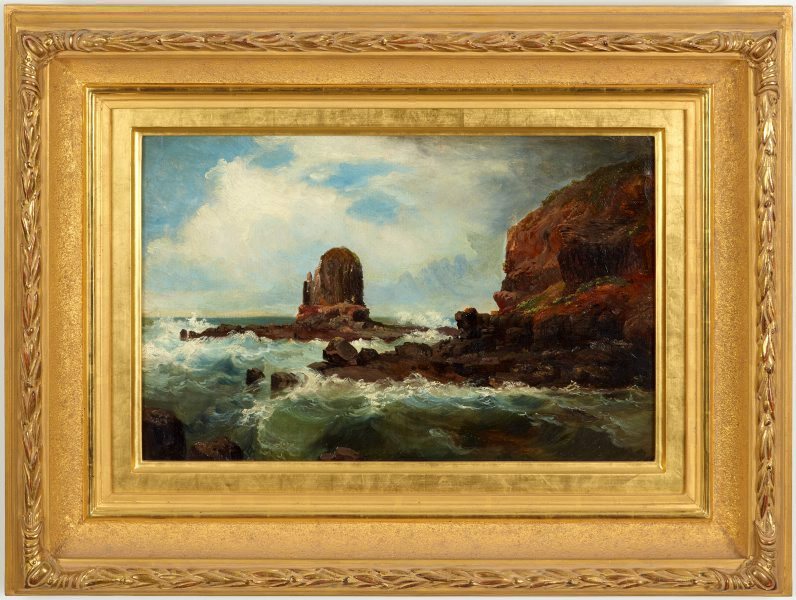 A keen artist–traveller in the Romantic tradition, Nicholas Chevalier concentrated on effects of atmosphere, mood and dramatic lighting in his depictions of the iconic natural wonders he found at Cape Schanck, on the southernmost tip of Mornington Peninsula. 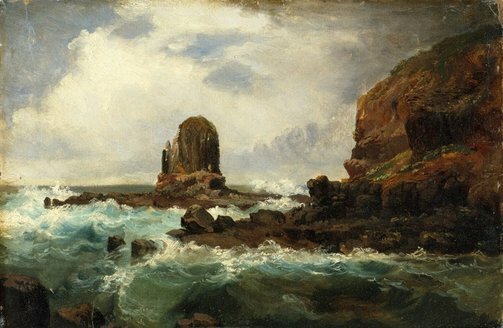 When Chevalier sketched the fantastically carved shapes of the rocks at Cape Schanck, he chose not to include any hints of human presence, although this remote part of the Victorian coast was already a tourist attraction for Melburnians in the 1860s. Andrew Frost, Conquest of space: science fiction and contemporary art , 'The engine of experience: contemporary art and SF', pg. 5-7, Sydney, 2014, 6, 13 (colour illus. ), 43. Simon Gregg, Nicholas Chevalier: Australian odyssey , Sale, 2011, 192 (colour illus. ), 193. cat.no. 55; related work cat.no. 117, 'Castle Rock, Cape Schanck', pg. 64 (colour illus. ), 225 (colour illus.). Danny Lacy, Coast: the artists' retreat, Cape Schanck to Point Nepean , 2017, 16, 17 (colour illus. ), 46. Anne Ryan, Australian art: in the Art Gallery of New South Wales , 'Colonial eyes', pg. 17-36, Sydney, 2000, 18, 33 (colour illus. ), 300. G.P. Smith (Editor), Age , 'The exhibition of fine arts: second notice', pg. 5, Melbourne, 31 Dec 1862, 5. 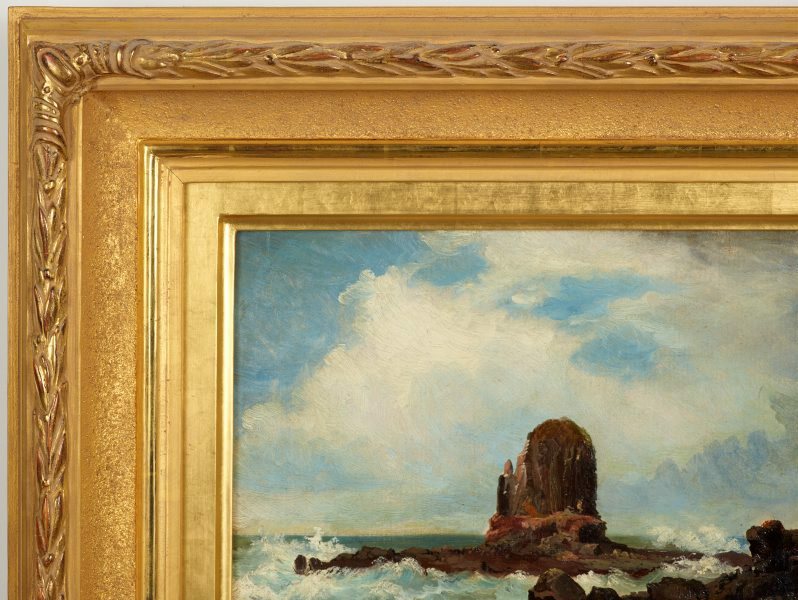 General review of 'rock work', including 'Elephant Rock' and 'Cape Schanck'. Olivia Welch, Nicole Welch: Eastern interiors: explorations from Bathurst to Albury , 'Nicole Welch: forward reflections', pg. 4-7, Waterloo, 2015, 7 (colour illus.). Nicholas Chevalier's 'Pulpit Rock, Cape Schanck, Victoria' is referenced in Nicole Welch's 'Apparitions' series.